Motifs from nature and our society stitched on dresses using traditional craft methods of India. And best of all - using scrap fabrics from the fashion industry. What could be more sustainable than this? 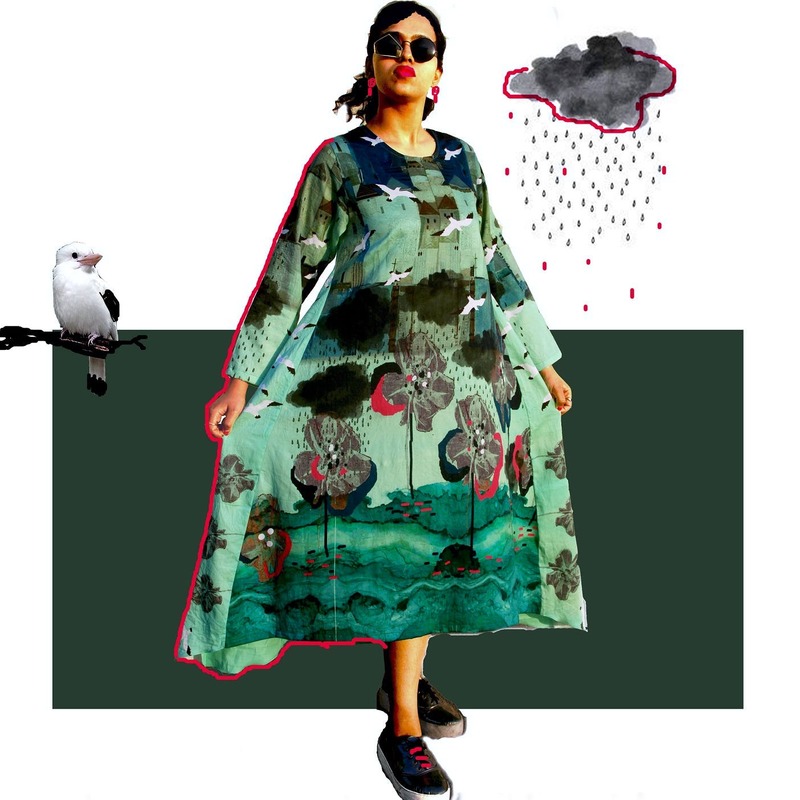 Kolkata brand Anubhuti's quirky collection is going to be a must-have item in our wardrobes. Anubhuti is a unique label that comes from a NIFT design graduate Anubhuti Jain. She makes designs out of factory waste and via upcycling methods. The label uses various traditional crafts using scraps of residual industrial fabric patches. The idea came to Anubhuti when she started working at an export house after college and used to visit the factory as a designer. She could see those tiny pattern cutouts in huge quantities lying in heaps as waste. "Those glittery, colorful bits entangled in themselves had a different story of their own." Soon she was using these to craft dresses and tunics, jackets etc. She has also been inspired by her mother, Madhu Jain's work as an artist. When you wear the dresses, you will be wearing one-of-a-kind, really quirky designs which sometimes tell a story. For instance, 'the busy balcony' - a story of a community living in the form of apartments where people are busy interacting, drying pickles, talking or just drying clothes. Another one is the 'lyricalroofs' one inspired from memories of old homes and their rusted beauty. These are all very reasonably priced - T-shirts start from INR 400 and prices of tops and tunics from INR 1,000. The label doesn't have a store right now - some designs are retailed through multi-designer stores such as Ommyra on Camac Street .Soon they will be available online as well. Anyone interested in buying can contact her directly..
Anubhuti also does a wide range of cotton T-shirts using similar techniques. The designs are different types of collages including animals, figurative depictions of a couple in love , or just ones from nature.